Edition No. 9 of Luftwaffe Im Focus continues on with the customary assortment of previously unpublished photographs, or higher quality images of previously published photographs. 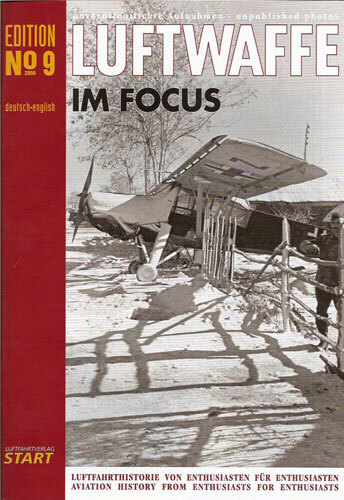 As in previous issues, Luftwaffe Im Focus devotes a page, or couple of pages, to an example of each of the various aircraft in Luftwaffe service, and of which there are unique photographs. Within Luftwaffe Im Focus, there are always the subjects that receive a bit more focus than other items. In this Edition, there are two that should not disappoint most Luftwaffe enthusiasts. The first articles deals with “The Colorful Aircraft of Oblt. Mütherich – Bf 109E-7, 5./JG 54 – III./JG 77.” The aircraft was Black 10, and was with Mütherich from his service with JG 54 on the English Channel to his deployment with JG 77 in the Balkans. The aircraft carries the identity markings of both theatres of operation. This article includes five excellent color photographs of Black 10 when it was stationed in Rumania. The author of the article throws down the color gauntlet by rejecting Jochen Prien’s view that the aircraft was painted in “greys”. The Im Focus author asserts that the colors were 70/71. I’m not sure I agree with that conclusion. The second focused article is in the section designated “pictures with a story”. This article focuses on a “Fighter-Bomber Mission against a Channel Convoy – Action by 2./JG 2 on 19 May 1941. The article is Lt. Dietrich Wickop’s personal account of that day’s action. The article includes photographs of Wikop’s Bf 109E-7, with an interesting outline only aircraft number. The article also includes a profile and a picture of a hand drawn map, in what appears to be crayon, done by Lt. Wickop. 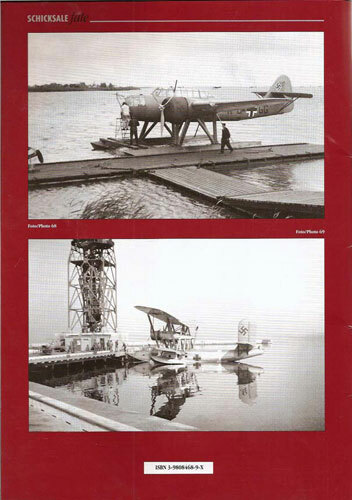 If you have been collecting each issue of Luftwaffe Im Focus, then there is every reason to continue on with this one. If you have not bought any previous edition, then this is a fine issue with which to start. Each one can stand on its own. There is a note in this issue that a special edition will be coming out in the immediate future. This will be titled “1945- The Last Months of the Luftwaffe”. It will include pictures of operationa Me 262, and Fw 190 D-9s , aircraft of “Zirkus Rosarius” and a color picture of that now famous black Bf109 Green 5. According to the publisher, this special edition will not be part of the subscription and must be purchased separately.